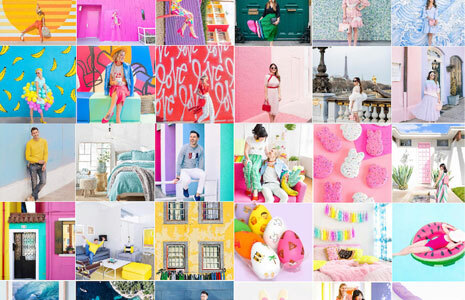 Add even more color to your life with these incredible Instagram feeds! Given our love of color, it should come as no surprise to you that scrolling through colorful Instagram accounts is part of our daily routines here at CarrieColbert.com. The more color the better! Or, as we say around here… More color, please! Indeed, there are some incredible accounts out there full of colorful inspiration. So, we decided to round up the very best colorful Instagram accounts for you! Now, for this round up, we solicited input from the whole CarrieColbert.com team. While color is a common thread throughout these accounts, it’s a diverse group with something for everyone! From fashion to food to flatlays and more, these accounts deliver all sorts of creative, colorful, clever content. If you’re not already following these accounts, be sure to click that follow button. These feeds will definitely not disappoint. And while you’re clicking that “follow” button, be sure to follow our hashtag – #morecolorplease! Yep, you can follow hashtags now. So, stay colorfully connected with the #morecolorplease movement. Now, keep on reading for the 39 most colorful Instagram accounts you need to follow immediately. And now we’re dying to know the colorful accounts you love to follow. Please let us know in the comments below! Oh thanks so much for sharing those! We will check them out immediately. And we are so glad you enjoyed this. account on instagram…You will love the Colorful Boho Vibes of that page.